← Painted Glass Concept Drawings! 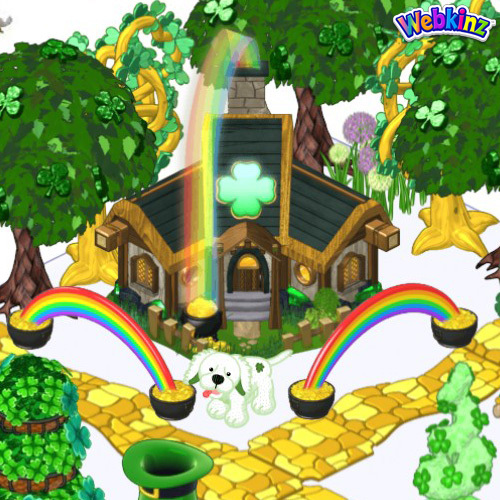 If your pet wants to feel as lucky as a Leprechaun, house them in the clever little Leprechaun’s Cottage! They’re sure to find it quite charming! Watch for the companion item, Clover Mosaic Tiles, to be released next week! 11 Responses to The Leprechaun Kinz Cottage is here! I bought the cottage the first day it was available and still can’t get the code to work three days later. Waiting on someone to respond to my email. The cottage looks really cute but placing it in a room would be nice since it was purchased with real money. Customer service has responded and placed the item in my dock. Thanks so much for your help! I wonder if this cottage will hide a doorway. Would love feedback from those who purchase one. Thank You! Almost covers the doorway, the chimney is as tall as the doorway, but it is narrow. If you complete the first part by March 29, the second part begins March 30. Very nice! Love the design, I’ll be getting this one.